Dashing for Drew 2018 is not actually "dashing", but pedaling. On Oct 20th I will be riding 50 miles on the IRT in the Lehigh Valley. A concession to the horror of my growing older, while simultaneously celebrating that my first born is growing up! 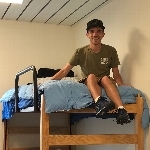 Pictured in his sophomore dorm, he will soon be turning 20! Despite the unrelenting passage of time D4D's focus remains exactly the same, finding a meaningful way to offer assistance to the NF Program here at CHOP. We are continually grateful for the dedicated men and women who provide care and hope to the NF patients each and every day. As I have shared before, while I wish Drew would never have had to walk this path in life, I cannot imagine us trying to navigate it without the amazing staff at CHOP, especially his neuro-oncologist without whom I would undoubtably have lost my mind multiple times! She has been nothing short of a lifeline for us, and perhaps her most impressive trait is her ceaseless capacity to guide her patients with clarity, honesty and kindness. So I ask, once again, that you join me in helping to support the NF Program! Even though Drew is no longer the little boy you used to see in the training videos, he still checks the site daily once it goes live, so feel free to leave him a comment - it will brighten his day. Thank you for your continued support of D4D and our efforts to make a significant impact on the NF Program here at CHOP! Wishing you all a happy and healthy fall!